TSH colors and styles for you this spring! We are thrilled to bring you some new colors, CX Fever, updated bibs, Mahalie Rochette Replica Jerseys, camouflaged caps, Bitchstix, new comfy socks and so much more. We also have a few standout pieces from our late fall collection that have finally made it into the store as well. Thanks for all the TSH love! 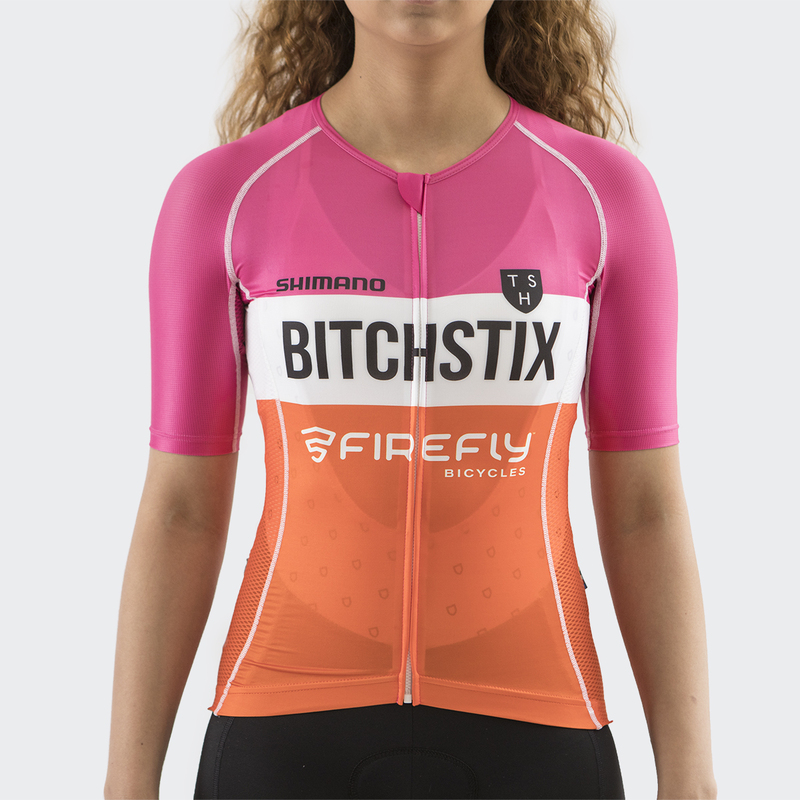 We are calling this our mood jersey because it just glows in the sun and its vibrance is undimmed in the shadows. We also changed the pattern just a bit. First thing is a low profile collar that still gives it that collarless look from our race fit. We also loosened up the sleeves so they fit a wider selection of arms. 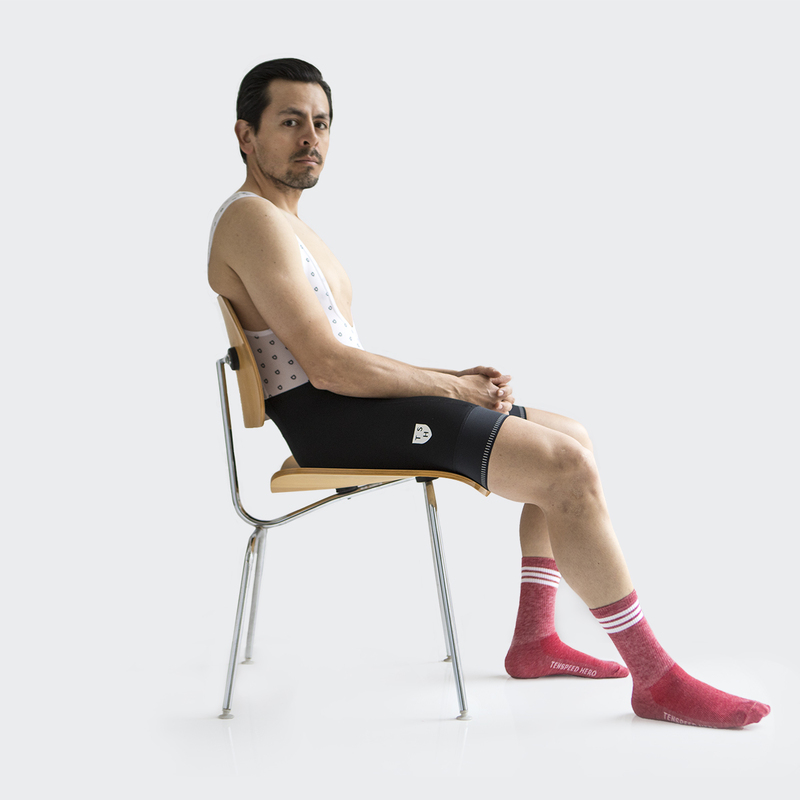 The most significant addition is actually a subtraction– a slightly shorter torso which we tested on several athletes and ambassadors last year. 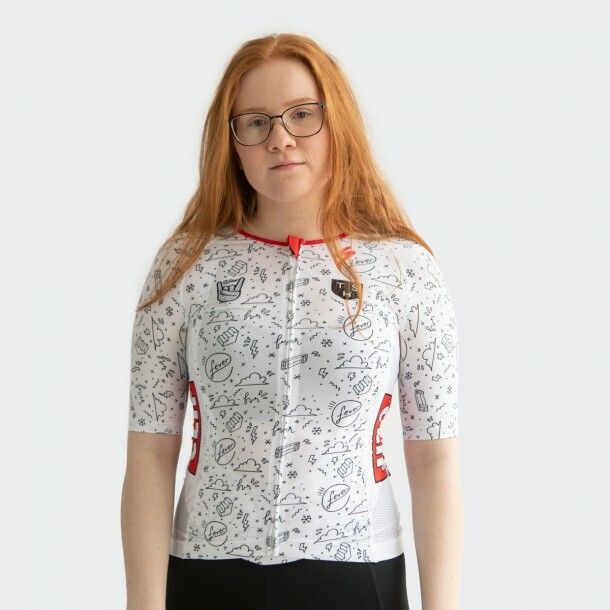 It fits perfect and allows for those riders who want a bit more room to size up and not have the jersey that is too long! 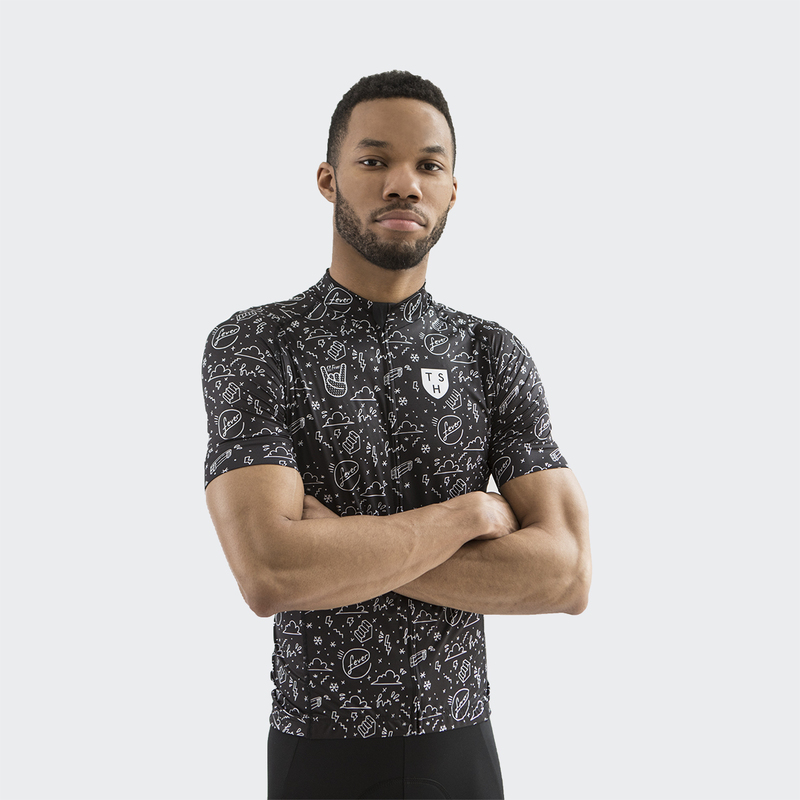 As always this piece is made with 4 unique lycra fabrics for fit and functionality. 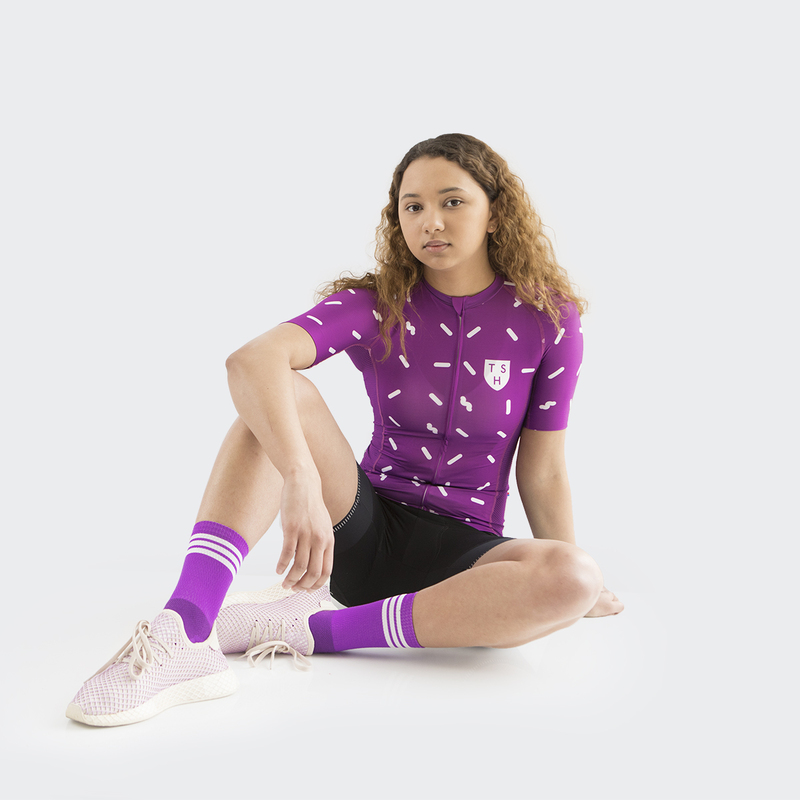 Purple maybe the historic color of queens and kings but its also the color for me and you and they and us.. 100% cotton T-Shirts for when you want to just pull on some cut-off shorts and go for a spin. On the sock front we made our three striped adventure socks in the waffle cone weave for durability and toughness and with our “Purple Socks Boi” we introduce our lightweight ribbed socks because we wanted absolute comfort that you get from a ribbed crew. Please test these out. We know you will love them! and btw, yes “Purple Socks Boi” have irrefutable “Hamburglar” vibes. Was it something we ate?!?! Maghalie Rochette…Where do we begin…. Her self-managed racing program came about late in the summer (we said how can we help!?!?) and she presented us with a “cx fever” pattern she worked on with Alexis Cartier! Voila we made her lots of kit and she smashed the north American racing circuit by winning the Canadian National Championship and the Pan American Championship in the same year. 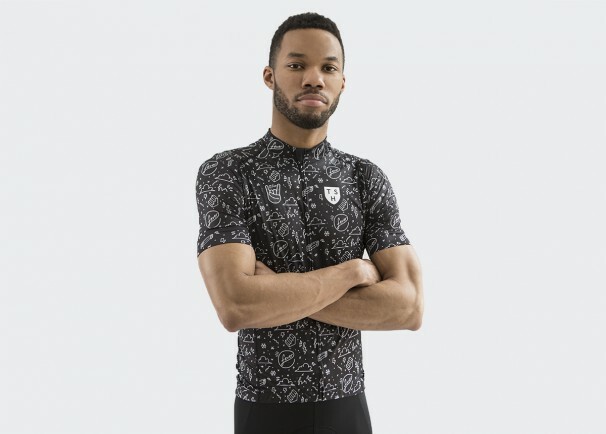 We offer a selection of her team kit and a black slim fit for men so you can share the fever. We also made a LTD release of replica Canadian National Champion jerseys for your cafe wall or your back. 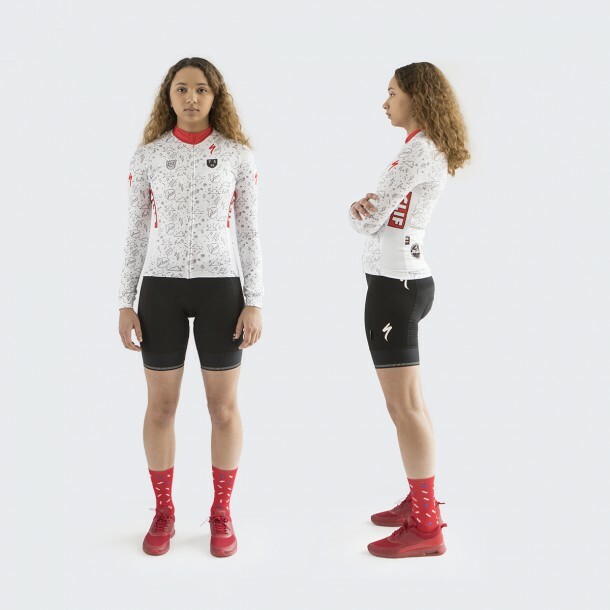 Next time you see someone wearing a Peter Sagan replica World Champion Jersey at your European sportive show them your Maghalie Rochette replica jersey. MAG! HA! LIE! Men’s Slim Blue Sprinkles is actually almost finished in production and will be shipping April 11 from Italy. Sorry for the delay. 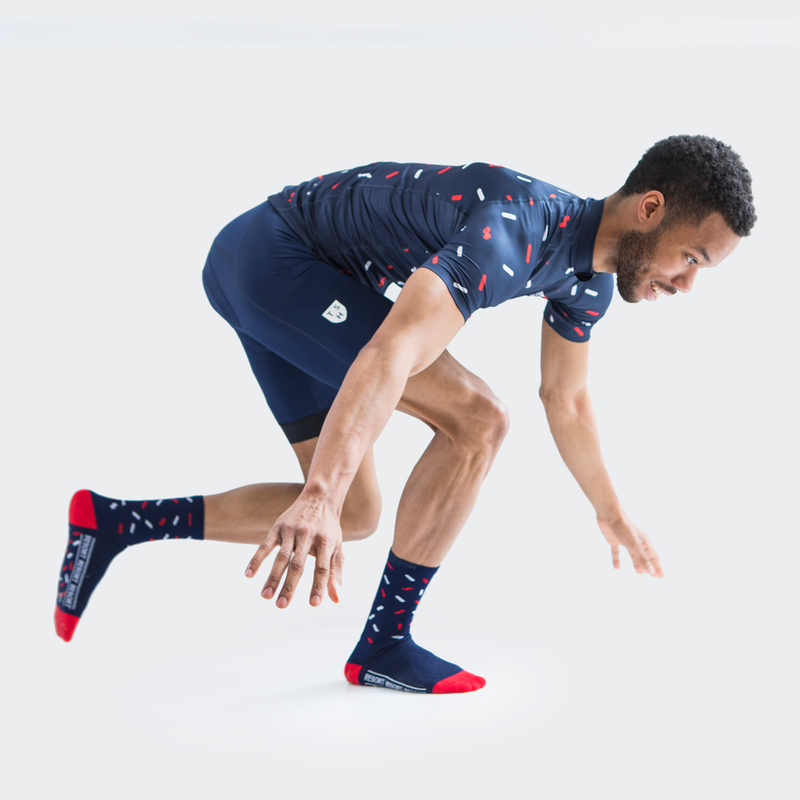 Women’s Navy Race Fit is in the store and features no collar, relaxed sleeves and our new shorter length. For size help do not hesitate to send us an email! We worked with our sock manufacuturer to find the perfect merino blend with recycled materials in a lightweight merino sock perfect for anytime of the year. We also wove this in our new ribbed crew for extra comfort. 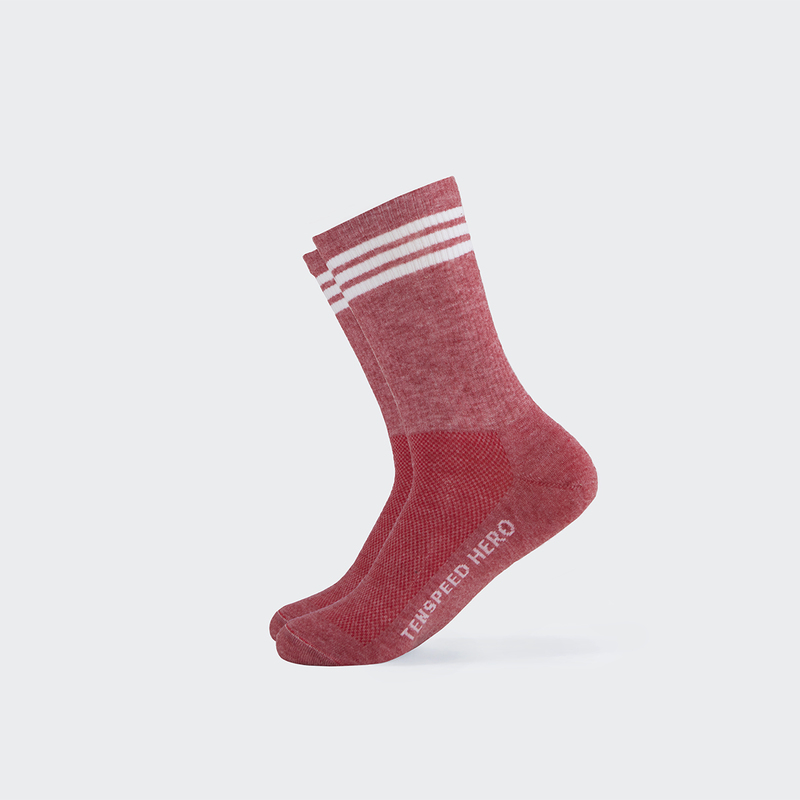 Fast wicking, oder resistant and soft. 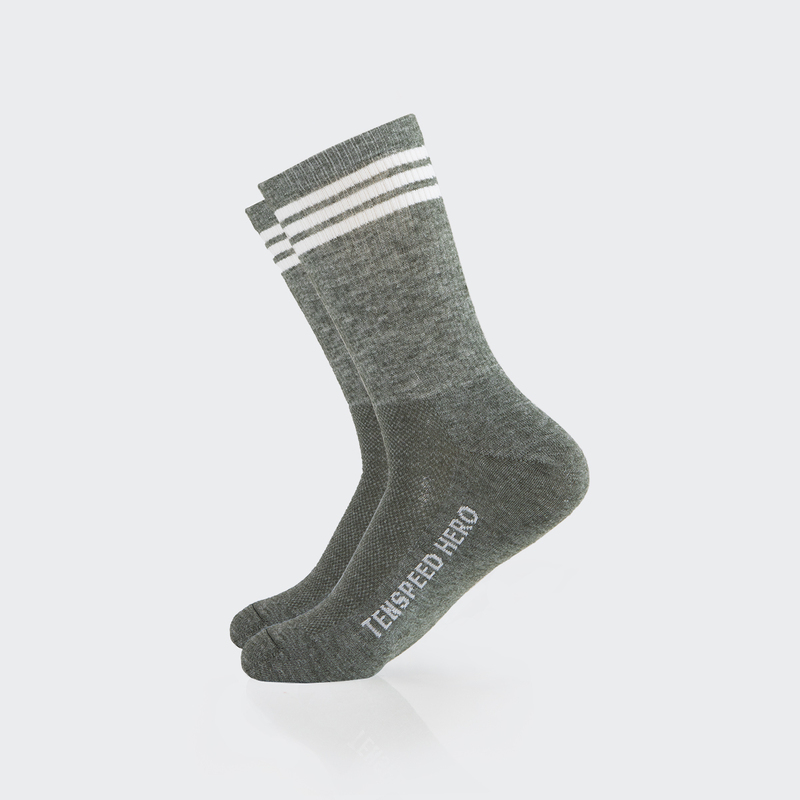 We love these socks for camping trips, gravel rides and believe it or not TENNIS! In 2019 we have an ambitious goal of creating a new real world fit guide for MEN and Women by working with our customers and sponsored athletes. How many sizes do we need? Lots! Everyone is different and there is not typical size so it will be great if you can find a close match, right!?! Many thanks to local Chicago cyclists Chris and Madeline who came by our shop for the first installment. Madeline is 5 foot 5 and 1/2 inches and 145lbs and she wears large in our Pro Shorts and a medium in our You Make It You Break It Jersey. Her measurements are 34 inch Bust, 29 inch Natural waist, 38 inch hips. Chris is 6 foot and 210 pounds. He wears our CX Fever slim fit in Large and Large in our Team Bibs. We sized him also in an X-Large Jersey and it gave him a bit more room but he preferred the fit of the large. Chris has a 42-44 sized chest and a 34″ waist. This is less about design that it is about the Team and their title sponsor. First, Bitchstix is Dani Arman, Kristen Legan and Emily Schaldach. Second Bitchstix is a face and bodycare company that donates proceeds to a host of great organizations working on domestic abuse and sexual assault prevention programs. 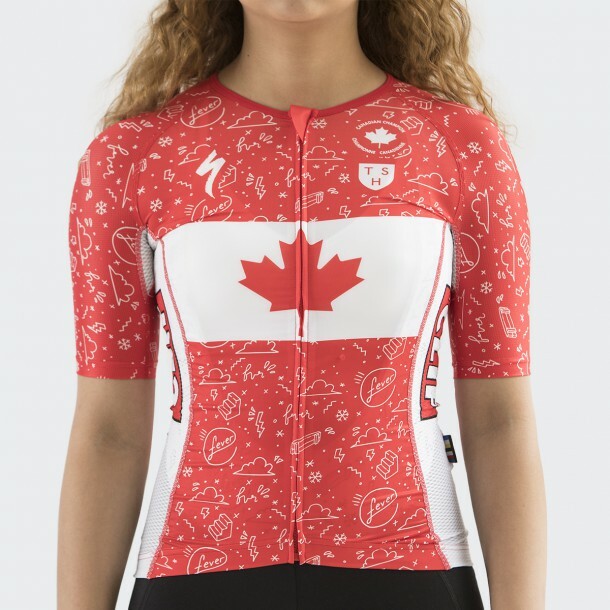 This team jersey is available for sale and of course we probably did not order enough!! Great group of women racers and a woman owned business with a larger mission than just selling product! Updates on Bibs are critical. Across all of our 2019 line we have gone to stitched elastic straps for comfort and extra stretch. Our Specialized / Tenspeed Hero team wore these all last year and we got an enthusiastic thumbs up for fit and comfort. On our Pro line for women we also updated our grippers to a new elastic holds firm and is more durable. We also added some reflective bits for those evenings on the bike when you are coming home late from a long ride. You can find our Black Pro shorts in two inseam lengths for fit preference. 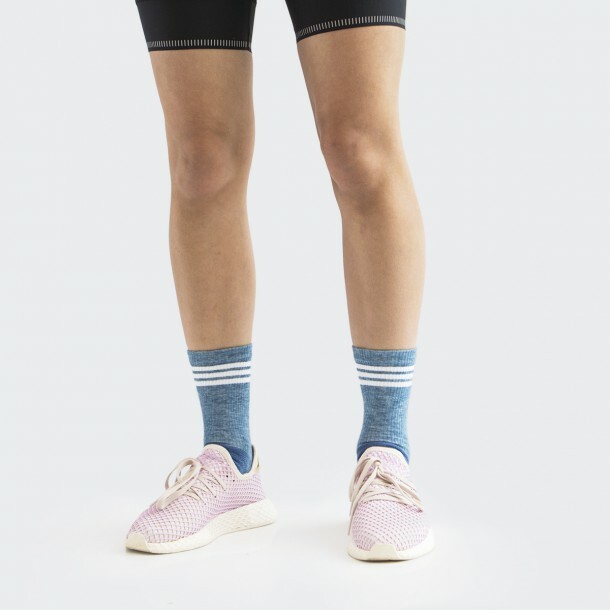 For Men we added a “classic line” to our Team Shorts (available in Navy). Same high quality lycra and chamois but we went light on the logos and added the same quality gripper though in the 45mm width. To make this just a bit softer on your bank account we also went with a non printed top. Awesome bibs and an awesome value. In the regular “Team” shorts we added a 72mm reflective gripper and a shield motif to our updated straps. Available in stealthy black. Tags: Cyclocross, purple, Tenspeed Hero.